* Cruises : Hurtigruten offers six cruises in Norway – The Voyage North, The Voyage South, The Round Trip, Taste of the Arctic, Voyage of Vikings and Astronomy Voyage. Apart from the regular cruises along the Norway coastline, Hurtigruten also operates shorter cruises (2 to 3 nights) which can be customised according to season and duration of travel. * Embarkation Points : Bergen is the main port of embarkation while Kirkenes is the embarkation point for South-bound voyages. Since Bergen and Kirkenes are not serviced by international flights, both these cities are accessible via domestic flight from Oslo. But we have an exciting alternative for visitors who start their voyage at Bergen. We recommend a scenic overland journey from Oslo to Bergen, by bus, train and ferry, through some of the most magnificent scenery in the region. This is a 9-hour journey across stunning fjords, rural idyll and the spectacular Flåm Mountain Railway, a masterpiece of modern engineering. 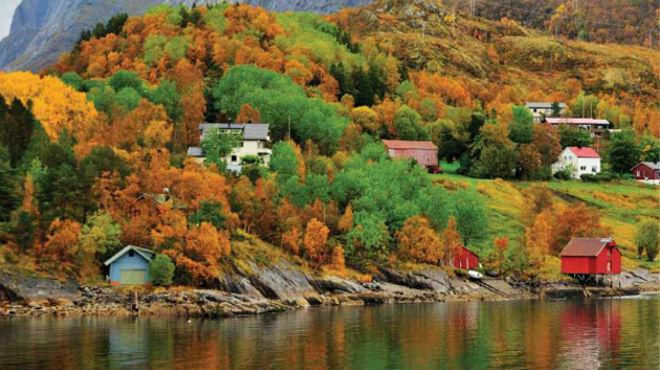 This extraordinary train journey is one of Norway's most popular independent day trips and is available all year round.